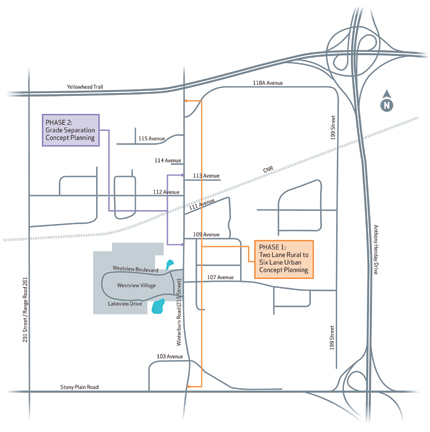 The City of Edmonton has developed a concept plan for the future of 215 Street from Stony Plain Road to Yellowhead Trail. 215 Street (Winterburn Road) is a major arterial road in west Edmonton and a 24-hour truck route. This route serves the adjacent industrial, business and residential communities. The project is separated into two phases. Phase 1 plans for a widening of 215 Street from the existing 2 lane rural to a 4 lane urban roadway from Stony Plain Road to Yellowhead Trail and Phase 2 includes a 215 Street/ CN Rail grade separation concept plan for the rail crossing between 109 Avenue and 113 Avenue. The 215 Street Planning Study is in the concept stage of the project lifecycle. Profiling interviews were conducted with Stakeholders adjacent to 215 Street who may be impacted by the changes.